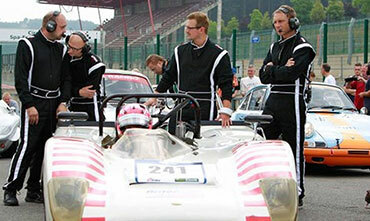 The winners of the FHR 3-hour endurance race at Spa Francorchamps, from 2014 and 2015, Felix Haas and Marco Werner could not realize the hat-trick. In 2014 and 2015, when you were victorious with a Daren and a Chevron B16, the team suffered this time the defect devil. Marco Werner confidently placed the Lola T210 in pole position on a wet track and also decided the start, but it should not be enough to reach the finish. 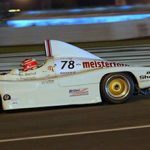 Werner, who won the Le Mans Classic on a Porsche 936 two weeks ago, pulled away quickly from the field. Already from the first round came the Le Mans winner with over 12 seconds ahead. In the first 1 ½ hours, Werner already covered the entire field twice. Two laps before Marco Werner should come to the scheduled driver change to the pits, the Lola lost power. Werner sparked the team the problems and asked for an earlier change. But the team of Britec Motorsports let Werner turn another round, as yet another car was dispatched in the pits. That was Werner’s fate. The performance loss was bigger and Werner rolled out before the Kemmel chicane. No more power, alternator defective, engine off! “It all went according to plan,” said Marco Werner after the failure, “we had a big lead, the car went well, I filled well in the car. I never drove it before the weekend. After the training we did a little bit of stuff on set up and I was satisfied. Then suddenly less power and pretty quickly the engine died. Too bad we wanted to get the hat-trick now. Winning here three years behind each other with three different cars, that was the goal “.